We cant believe it is already week 23. The turkeys are getting bigger by the day which is a constant reminder that thanksgiving is right around the corner. We have the beginnings of frost in the forcast so we’re either covering or getting a final harvest out of all our summer crops. With the drop in temperature our root crops and leafy greeens should sweeten up. We still have a full 5 weeks planned for you, and many hearty recipes on the way. 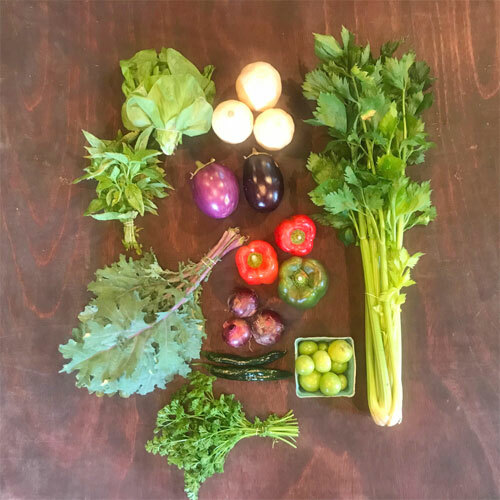 Thank you for supporting our farm and have a wonderful week! Slice 2 eggplant into 1/4 inch slices along the length of the fruit. Dip eggplant into 2 beaten eggs and 2 cups of Italian seasoned bread crumbs. Place in a single layer on a baking sheet and bake for 5 minutes on each side. In a 9x13 inch baking dish spread 1 cup of spaghetti sauce to cover the bottom. Layer baked eggplant over the sauce, then sprinkle with 4 oz of mozzarella cheese and 2 tbsp grated Parmesan cheese. 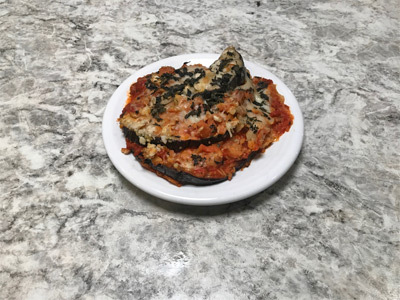 Repeat with more eggplant and cheese layers, finishing with a cheese layer and a total of 12oz of mozzarella used, and 6 tbsp Parmesan cheese. Sprinkle with 2 tbsp fresh basil, finely chopped. Bake for 35 minutes, or until golden brown. take 1 whole pasilla bajio pepper, 1 whole red onion, and 1 pint of tomatillos and lightly coat each with olive oil. Then broil for 10 minutes, rotating items every few minutes, and flipping halfway. Remove from oven, then place in plastic covered bowl and allow to steam for 10 minutes. 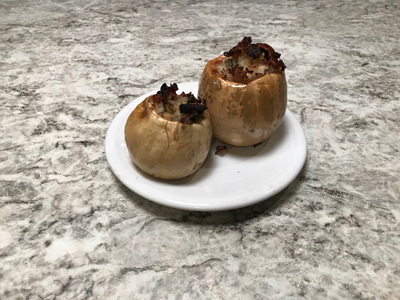 Remove scorched skins, then add to a blender with 1/4 cup parsley, 1 clove garlic, 1 tsp cumin, and a pinch of salt and pepper. Blend until chunky. Preheat oven to 350F. Cut 3 bell peppers lengthwise in half and remove the seeds and stems. Salt and pepper the inside of the peppers and set aside. In a medium pan heat 2 tbsp olive oil and add 1 butterflyed chicken breast. Cook over medium heat for 5 minutes each side. Remove chicken, then add 1 chopped red onion, 1 diced pasilla bajio pepper, and 1clove minced garlic. Saute until tender, about 5 minutes, then remove from heat and combine with 1 cup queso fresco cheese, all shredded chicken breast, 2 tbsp diced parsley, 1 tsp chili powder, and 1 tsp cumin. 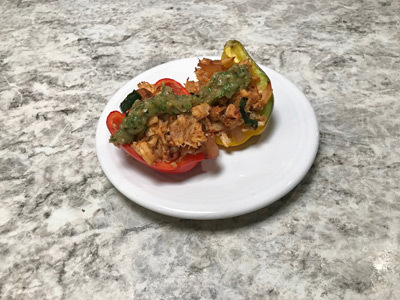 Spoon chicken mixture into the cavity of the bell peppers. Bake in oven for 20-25 minutes, or until the peppers are tender. Plate with the tomatillo salsa and more crumbled queso fresco. 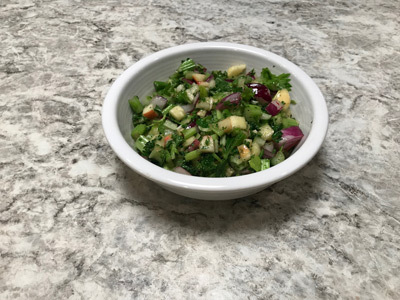 Dice 2 cups of celery, 2 cups of apple, 1/3 cup red onion, and 1/4 finely chopped parsley. Combine 1/4 cup extra-virgin olive oil, 2 tbsp fresh lemon juice, 1/2 tsp salt, and 1/4 tsp pepper. Mix chopped ingredients in a large bowl, then toss with dressing. To make vinaigrette combine 1 tbsp red wine vinegar, 1/4 cup olive oil, 1/2 tsp salt, and 1/4 tsp ground black pepper. 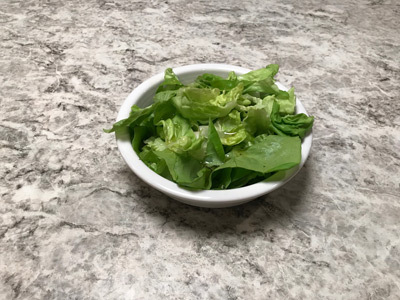 Roughly chop lettuce and dress with vinaigrette. Heat 3 buffy squash in the microwave for 4 minutes. Remove, allow to cool, then cut off top 3/4 inch from the stem. Scoop out seeds. Place 1/3 tbsp butter in each cavity. Set squash in baking dish. In a large skillet over medium heat add 2 tbsp olive oil. Cook 1 butterflyed chicken breast, 5 minutes each side. Remove chicken from pan and add 1/4 cup chopped red onion, 1/4 cup chopped celery, and 1/4 cup chopped carrots. Cook until the begin to soften, about 10 minutes. Deglaze the pan with 1/2 cup white wine. Meanwhile, cook 1/2 cup dry rice. Shred chicken breast, then return to pan along with cooked rice, 1 bunch thinly ribboned red Russian kale, about 1/2 cup, 1/2 cup crushed walnuts, 1 tsp salt, and 1/2 tsp pepper. Cook mixture, stirring frequently, for 3 minutes, then remove from heat and stuff mixture into squash. Tent aluminum foil over squash and bake for 1 hour or until squash is tender.